This is a perfect dessert for fall. Enjoy! 1. Preheat oven to 350°F (180° C). Bake pecans in a single layer in a shallow pan for about 7-8 minutes or until lightly toasted and fragrant, stirring halfway through.Remove from oven, let cool down, and chop. Reserve. 2. Reduce oven temperature to 325°F (about 160° C). Grease and flour a 9-inch (22.5 cm) spring-form pan. Sprinkle pecans over bottom of the prepared pan and reserve. 3. In a heavy-duty electric stand mixer, beat cream cheese, granulated sugar, and vanilla at medium speed until well-blended and smooth. Add 3 eggs (1 at a time), beating after each addition until just blended. Reserve. 4. In a separate large bowl, whisk together brown sugar, melted butter, and remaining egg until blended. 5. Then stir in the flour, cinnamon, baking powder, and salt. Add the peeled and diced apples to the mixture and stir gently. 6. Spoon batter into prepared pan. 7. Carefully spoon cream cheese mixture over batter. 8. Bake at 325°F ( about 160° C) for 70 minutes or until set. 9. Remove from oven, and gently run a knife around outer edge of cheesecake to loosen from sides of pan but do NOT remove sides of pan. 10. Cool completely in pan on a wire rack for about 2 hours. 11. Remove side of the pan and transfer to a serving plate. 12. Meanwhile, prepare Caramel Apple Topping and Caramel Sauce. Spoon topping over cheesecake; drizzle with 1/2 cup Caramel Sauce. Reserve 1 cup Caramel Sauce to drizzle over the cheesecake later if you have not served the whole dessert at once. 14. In a large skillet over medium heat, melt the butter; then, add both the sugar and lemon juice. 15. Cook, stirring constantly with a long-handled wooden spoon, for 5 to 6 minutes or until mixture turns a light golden brown. 16. Add the apple wedges and cook, stirring often, for 15 to 18 additional minutes or until apples are tender and caramelized. 17. Remove from heat and let cool for 20 minutes. 18. Meanwhile, prepare Caramel Apple Topping and Caramel Sauce. 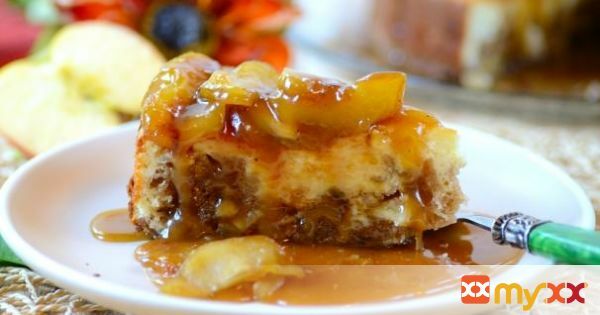 Spoon topping over cheesecake; drizzle with 1/2 cup Caramel Sauce. Reserve 1 cup Caramel Sauce to drizzle over the cheesecake later if you have not served the whole dessert at once. 20. In a medium saucepan over medium-high heat, bring the brown sugar, butter, whipping cream, and honey to a boil, stirring constantly; then, boil — stirring constantly– for 2 minutes. Remove from heat, stir in the vanilla, and cool 15 minutes before serving. 21. ** Store any leftovers in an airtight container in refrigerator up to 1 week. To reheat, microwave at HIGH 10 to 15 seconds or just until warm; stir until smooth.